Pri is a creative junkie + content wiz helping brands and businesses clarify their messages, create visibility, establish authority and connect to the hearts (and pockets) of clients and customers via storytelling magic and intensive market research. With a background in depth psychology and mental/behavioral health, Pri is able to tap into deepest desires and collective trends that help to craft compelling content which speaks directly to audience pain points. Pri provides brands with content strategy that helps to organically increases sales and engagement. 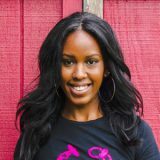 Her experience in copywriting and content writing expands over 3+ years and across a variety of industries. If you can’t find her in the digital office, check your local online astrology forum or nearest snack cabinet. She also loves all things health, fitness and pastel.